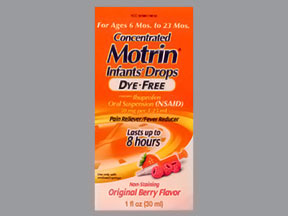 Help your little one feel better with Infants" Motrin Concentrated Drops. Containing 50 milligrams of ibuprofen per 1.25-milliliter dose, these pediatrician-recommended drops provide up to eight hours of relief from minor aches and pains due to the common cold, flu, sore throat, headaches, and toothaches. This berry-flavored formula is free of dyes and alcohol and is for use in infants 6-23 months. Warnings: Allergy Alert: Ibuprofen May Cause A Severe Allergic Reaction, Especially In People Allergic To Aspirin. Symptoms May Include: Hives, Facial Swelling, Asthma (Wheezing), Shock, Skin Reddening, Rash, Blisters. If An Allergic Reaction Occurs, Stop Use And Seek Medical Help Right Away. Stomach Bleeding Warning: This Product Contains A Nonsteroidal Anti-Inflammatory Drug (Nsaid), Which May Cause Stomach Bleeding. The Chance Is Higher If The Child: Has Had Stomach Ulcers Or Bleeding Problems; Takes A Blood Thinning (Anticoagulant) Or Steroid Drug; Takes Other Drugs Containing An Nsaid (Aspirin, Ibuprofen, Naproxen, Or Others); Takes More Or For A Longer Time Than Directed. Sore Throat Warning: Severe Or Persistent Sore Throat Or Sore Throat Accompanied By High Fever, Headache, Nausea, And Vomiting May Be Serious. Consult Doctor Promptly. Do Not Use More Than 2 Days Or Administer To Children Under 3 Years Of Age Unless Directed By Doctor. Do Not Use: If The Child Has Ever Had An Allergic Reaction To Any Other Pain Reliever/Fever Reducer And/Or Nasal Decongestant; Right Before Or After Heart Surgery. Ask A Doctor Before Use If The Child Has: Problems Or Serious Side Effects From Taking Pain Relievers, Fever Reducers, Or Nasal Decongestants; Stomach Problems That Last Or Come Back, Such As Heartburn, Upset Stomach, Or Stomach Pain; Ulcers; Bleeding Problems; Not Been Drinking Fluids; Lost A Lot Of Fluid Due To Vomiting Or Diarrhea; High Blood Pressure; Heart Or Kidney Disease; Thyroid Disease; Diabetes; Taken A Diuretic. Ask A Doctor Or Pharmacist Before Use If The Child Is: Taking Any Other Drug Containing An Nsaid (Prescription Or Non-Prescription) And/Or Pseudoephedrine Or Any Other Nasal Decongestant; Taking A Blood Thinning (Anticoagulant) Or Steroid Drug; Under A Doctor's Care For Any Serious Condition; Taking Any Other Drug. When Using This Product: Do Not Exceed Recommended Dosage; Take With Food Or Milk If Stomach Upset Occurs; Long Term Continuous Use May Increase The Risk Of Heart Attack Or Stroke. Stop Use And Ask A Doctor If: The Child Feels Faint, Vomits Blood, Or Has Bloody Or Black Stools. These Are Signs Of Stomach Bleeding; Stomach Pain Or Upset Gets Worse Or Lasts; The Child Does Not Get Any Relief Within First Day (24 Hours); Fever, Pain Or Nasal Congestion Gets Worse Or Lasts For More Than 3 Days; Redness Or Swelling Is Present In The Painful Area; Any New Symptoms Occur. Keep Out Of The Reach Of Children. In Case Of Overdose, Get Medical Help Or Contact A Poison Control Center Right Away (1-800-222-1222). Ingredients: Active: Ibuprofen 50 Mg. Inactive: Artificial Flavors, Citric Acid, Corn Starch, Glycerin, Polysorbate 80, Purified Water, Sodium Benzoate, Sorbitol, Sucrose, Xanthan Gum.